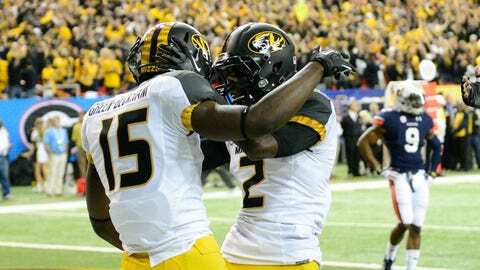 Mizzou wide receivers Dorial Green-Beckham (15) and L'Damian Washington (2) both figure to have a future working on Sundays. COLUMBIA, Mo. — Missouri quarterback James Franklin says he doesn’t get the urge to rear back and heave a pass just so he can watch his Megatron-sized receivers go up, up and up to bring the ball down. "No sir, I like to throw an accurate pass," Franklin says. But he allows himself a smile at the thought. "It’s comforting to know that if I throw a jump ball, more times than not, they’ll come up with the ball," he says. Indeed, size makes a difference on Missouri’s receiving corps. The Tigers’ three leading receivers could make many a front line in basketball: 6-foot-6 Dorial Green-Beckham, 6-5 Marcus Lucas and 6-4 L’Damian Washington. Green-Beckham and Lucas topped the team with 55 receptions each, including a team-best 12 for touchdowns by Green-Beckham. Washington, slowed much of the second half of the season with turf toe, finished with a team-high 853 receiving yards and 47 catches, 10 for TDs. The trio certainly has caught the attention of Oklahoma State, which faces Missouri in the Cotton Bowl Jan. 3. The Cowboys have had trouble against passing attacks of all sizes this season, allowing the most receptions and the second-most passing yards in the Big 12. To keep the Tigers’ trio grounded, the Cowboys are planning to get tough. "They’re big guys so we’re going to have to get our hands on them and play physically," said Cowboys safety Daytawion Lowe, a 5-11 senior, at a recent media session. "It comes down to attacking the ball in the air. They’re big so they’re going to try to go up and get the ball and box you out. We play the ball well, I think we’ll be all right." Though Oklahoma State boasts no starter taller than 6-0 in its secondary, the Cowboys can lean on one of the nation’s top defensive backs, senior All-American Justin Gilbert. Look for Gilbert to spend much of his evening tracking Green-Beckham, the "five-star guy" as labeled by Oklahoma State coach Mike Gundy. If Green-Beckham wasn’t the Tigers’ top threat at the start of the season, he was by the end. He caught seven TD passes in his final four games, and twice went for more than 100 yards. His emergence coincided with Washington’s left foot injury, suffered Nov. 9 against Kentucky. Washington has not missed a game but he hardly has been able to practice. He said last week the toe still bothers him, and he is undergoing treatment as often as three times a day. He insists he isn’t missing the Cotton Bowl, either, even though he knows it could cost him valuable time preparing for the NFL draft. "Every game, I’m really re-injuring it," Washington said. "It needs time to heal on its own. It’s just one of those things, but it does hurt." Seen on draft boards as a fourth- or fifth-round pick before the season, Washington helped his standing by leading the Tigers’ receiving corps for the season’s first two months. That is saying something when you’re on a team with Green-Beckham, a sophomore who already is seen as a top NFL prospect. It seems the Tigers’ trio has more going for it than height. Coach Gary Pinkel, in fact, says Missouri did not set out to recruit a basketball team to handle its wideout spots. "For some reason, we’ve ended up with a load of big guys," he says. He’s not planning to eliminate the 6-foot-and-under club from being recruited. But if you’re not tall, you need to be extra good. "We don’t sit there and say if he’s under 6 foot, we’re not going to recruit him," Pinkel said. "My big thing is, if we’re going to recruit a guy that is not tall, he has to bring something really special to the dance." After all, this trio matches its tallness with talent. As Pinkel says, "We’ll lean toward size but you still have to be able to run. If you can’t run and play, the height doesn’t matter." Having the height pays off not only on the football field. Washington says his crew can hold its own on the basketball court, too. The footballers have "torn up" some of the Tigers’ basketball players in pickup games — "It wasn’t the starters so you kind of discredit that," he said — and they enjoy trying to out-dunk one another when the opportunities arise. "We probably have more arguments about who’s the best basketball player than anything," said Washington, who acknowledges that Lucas is tops among the receivers. "We have a tall group of guys and all the guys are talented." Such a combination has paid off big for the Tigers.